What’s Your Genius is our foundational workshop, designed to give you insight into the strengths of your behaviors, motivators and decision making styles. It lasts a half day and strikes a balance between lecture and activities. It is also included in the first day of all the other workshop solutions. 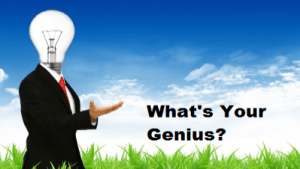 What’s Your Genius is highly beneficial for everyone in the organization: senior leadership, management, and the general workforce. Participants receive insight and awareness not only of their unique strengths but those of their team. Even if you aren’t taking the next steps to leadership development, emotional awareness training, or team performance training, What’s Your Genius will provide a solid foundation for further development, help reduce organization friction and raise organizational effectiveness. The What’s Your Genius Workshop is based on an amazing tool called Advanced Insights, which combines four extremely powerful profiles into one. These profiles are the Attribute Index, the Emotional Intelligence Attributes, the Values Index, and the DISC Index. The Attribute Index, is a revolutionary way to measure organizational skills and competencies to increase individual and team efficiency and effectiveness. Built specifically for the business environment, and to be easy to use by any manager, the Attribute Index assesses an individual’s cognitive style (i.e., how they think). The profile is based on the groundbreaking work of Dr. Robert S. Hartman (Yale/MIT) and is a uniquely powerful way of actually quantifying an individual’s ability in over 80 business related areas. Over 30 validation studies make the Attribute Index one of the most powerful and reliable profiles on the market today. Used by more than 300,000 people in over 18 countries, the Attribute Index can help in finding, developing and keeping the very best talent. The Values Index, combines the work of Drs. Spranger and Allport to create the most powerful motivations profile on the market today. Such information is vital when it comes to motivating employees, making hiring and selection decisions, understanding performance issues or anywhere that requires understanding what drives, motivates and inspires an individual. Understanding WHY someone does what they do is the key to understanding how to get them well aligned with work and in an environment that will lead to the most passion. The DISC Index, is the most contemporary interpretation of Dr. William Marston’s groundbreaking work into understanding and measuring a person’s natural behavioral style. Understanding individual behavioral preferences and habits is crucial when working with team members, as a leader or manager of others, or in an environment that requires conflict resolution. The DISC Index can be used in a wide variety of situations, such as selection and hiring, succession planning and team development.